On October 10, 1960, The Queen opened the new Queen's Bridge in Perth, Scotland, and was presented with a brooch as a gift. The brooch is described in Leslie Field's The Queen's Jewels as "a miniature flower bouquet with seven amethyst buds surrounded by white and yellow gold ferns and grasses, with a central group of twelve freshwater mauve-tinted pearls from the River Tay." Based on that description, the brooch has often been misidentified as the Amethyst Bouquet Brooch, which includes seven amethysts but does not otherwise match the description. The actual Perth Bridge Opening Brooch is instead the one pictured here. 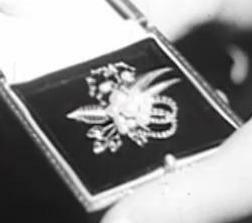 The video above shows The Queen being presented with the brooch, and admiring it at length. This alternate footage displays the brooch. The Perth Bridge Opening Brooch has only rarely been worn in public by The Queen. 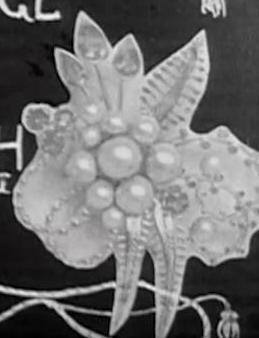 This is an intricate design, and the delicate sprays almost disappear, so it's not an easy identification. I suspect we haven't really seen it worn to its greatest effect. Thanks to Franck for sending in information about this brooch!